If you research the best time to sell your home, you’ll likely find a variety of articles that cannot seem to agree. In reality, each season offers its own set unique benefits for selling, and the holiday season is no exception! Are you in the market to sell your home during the holiday season? Check out a few of these helpful tips, and let our team lead you to a selling success with your New Jersey home! During the winter season, there are typically fewer people looking for a home — but that’s actually good news for you! With a smaller market to choose from, you won’t have to worry about people seeing a handful of homes similar to yours. Plus, it probably eliminates any neighborhood competition. Since the market is so small, the buyers looking for homes will likely be more motivated than usual. This motivation in combination with fewer competing listings allows you to haggle the price of your home to your advantage. Also, both parties will be motivated to close quickly, meaning you won’t have to deal with a drawn-out closing process. Although this isn’t a tip specific to the holidays, it’s perhaps the most important thing to remember. 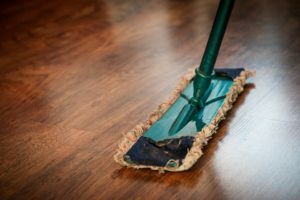 One of the biggest turn-offs to buyers is walking into a messy home, so before you start decorating make sure you put in plenty of elbow grease. Grab your best pair of rubber gloves and get ready to scrub the bathrooms, deep clean the carpets, brighten up your appliances, and touch up any paint chips. Also, if you have any unfinished projects laying around, make sure you finish them up. The last thing a buyer wants is to inherit a laundry list of projects that they didn’t sign up for. Make your home shine, and it’s sure to stand out! Since you’ll be showing your home during the winter months, you might have to deal with a little snow. 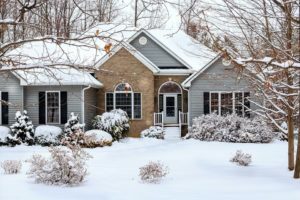 While snow does help you get out of doing things like mowing your lawn and tending to the garden, make sure it doesn’t get in the way of the buyers. Shovel off your sidewalks and lay down some salt to avoid any unwanted and unwelcoming grey slush. Once your home is fresh and clean, the fun part begins. Before you get started, just remember that the key to selling your home during the holidays is to know the limit. 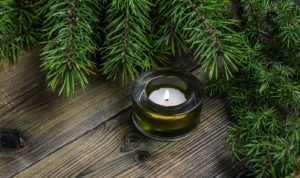 While tapping into the holiday spirit is great for making buyers feel warm and cozy, it’s easy to go overboard. When decorating your home for a showing, it’s best to remember that less is more. Maybe keep all of the giant blow up holiday characters in storage, but bring out the tasteful white lights and strings of greenery. Another important thing to remember is to keep your decorations neutral. While you might celebrate a specific holiday during the month of December, there’s no way to know if your buyer does, too. Have fun with your seasonal decor, but keep in mind where the line is. Did you know that smell is one of the most powerful senses when it comes to setting the mood? Use this to your advantage, especially during the holiday season! Put some fresh cookies in the oven, light a few scented candles, or use some strategically place cinnamon sticks. These tricks will make your buyers feel comfy, cozy, and even more at home. Proper lighting is another important part of setting the mood. Although there might not be a ton of natural light during the winter months, opening the shades and letting in whatever sunlight there is makes a big difference. If it’s a little too overcast outside, try making your indoor lighting cozier. 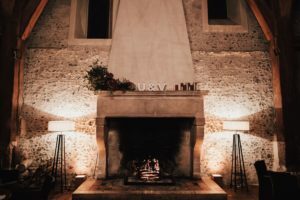 Using warmer bulbs, lighting candles, and firing up the fireplace can make your home a warm and welcoming sanctuary in the unforgiving winter weather. Are you ready to put your home on the market? In addition to all of these helpful tips, we offer a variety of resources for sellers in the area. Browse our website for more information, and let us lead you to real estate success. If you have any questions or are ready to get started, don’t hesitate to contact us today!